We awoke to the rude sound of our iPhone alarm at 7am, and slowly headed up to the pool area for 30 minutes of yoga/stretching exercises, followed by a buffet breakfast of orange juice, pastries, eggs, etc. I was feeling rejuvenated after the stretching and meal, and was ready to start the day. I packed up my video camera, batteries, memory cards, mini-tripod, and met up with the members of the tour. 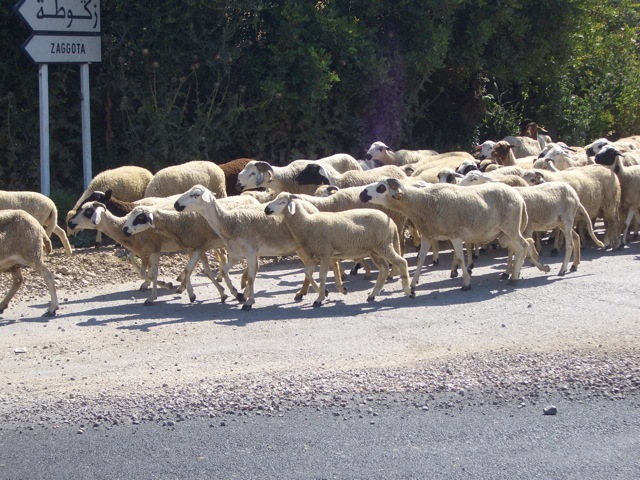 We started by walking down from the hotel to the Volubilis city ruins, past fields of sheep and donkeys (the donkeys do a lot of work around here). It was a nice cool breezy morning, and the walk was very refreshing. We spent a couple hours at the ruins, led by a local guide who gave us the history of the city, and pointed out some of the more interesting things to see, such as mosaic floors, remnants of old homes, baths, the main “street” (complete with an early underground sewer system), and the big city “arch”. 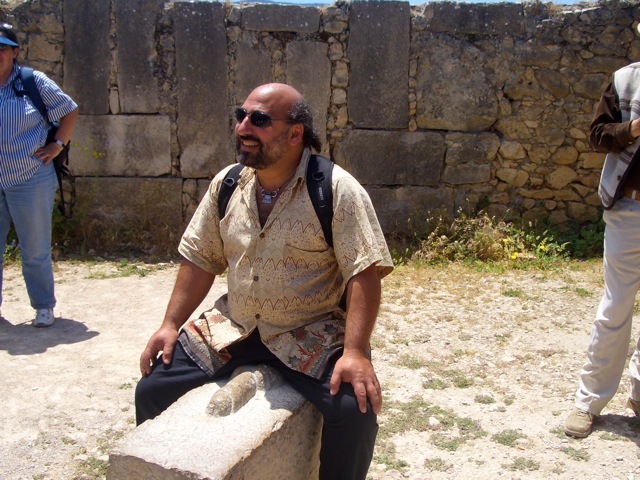 Also, we were shown a stone carving of a large erect “member”, and we all got a good laugh as Dror, Jaime, and a few others sat upon the rock containing the stone dong and pretended they were so well endowed. 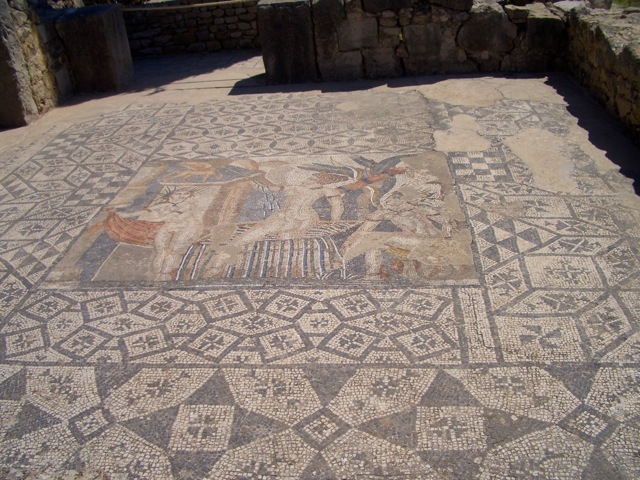 I’m a big fan of touring old ruins, and Volubulis didn’t disappoint. 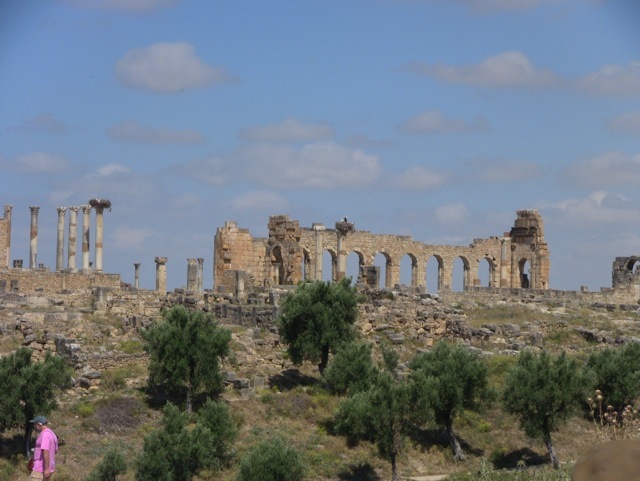 We then walked from the ruins to the city of Moulay Idriss, one of the oldest and one of the holiest of Islamic cities in Morocco, up on of a large hillside. Some tour members opted to take the tour bus between the two cities, but I choose to walk the complete distance (a few more miles). 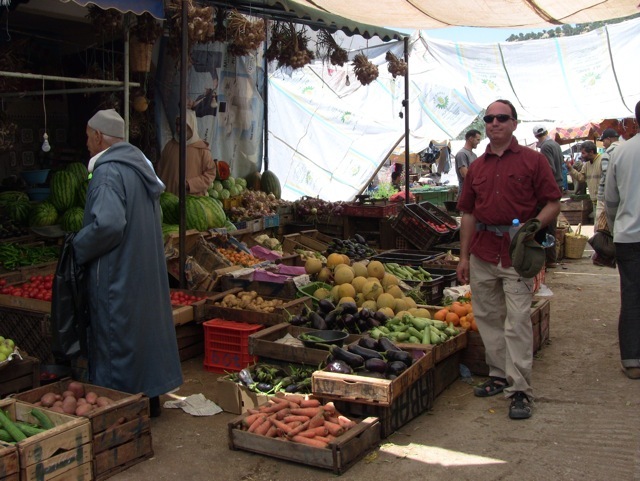 It was well worth the walk, since when we first entered the city, we got to walk through a local market area, where street merchants were selling fruits, meats, spices, and many items you’d never find in a market in America (snails, live chickens, large bins of spices, whole sheep carcasses hanging, etc.). All sorts of interesting sights and smells to take in. 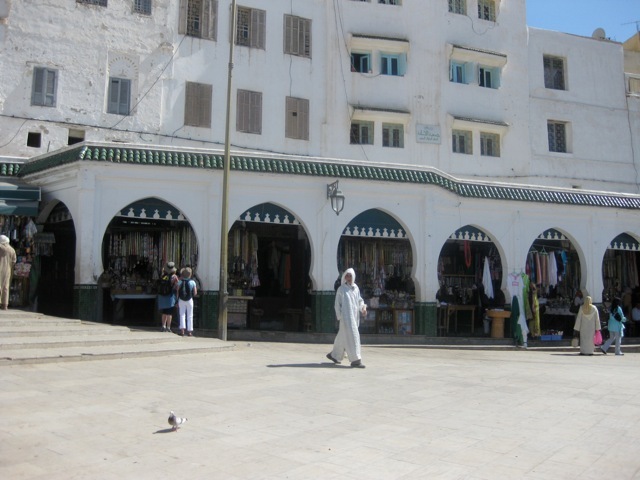 We made it to the city square, where we met up with most of the tour members, and ate a nice lunch of lamb, bread, vegetables, olives, and, of course, Moroccan mint tea (loaded with sugar). We did some shopping in the square, and I found a “TeleBoutique”, where I was able to make a quick call home and talk to my wife, Andrea, and two of my three kids (Jeremy and Jordan). I was feeding coins in to the phone as fast as I could, and the entire 10 minute call cost 70 dirham (about $9). It was nice to talk to the family for the first time since I left New York. 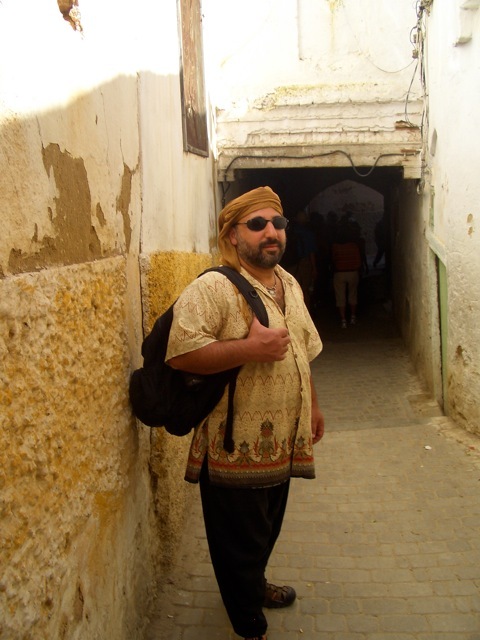 Next, Hamid led us through the narrow streets and alleys of Moulay Idriss, and discussed more about the history of the city, and some things about Islam and religion in Morocco (video to be posted later). 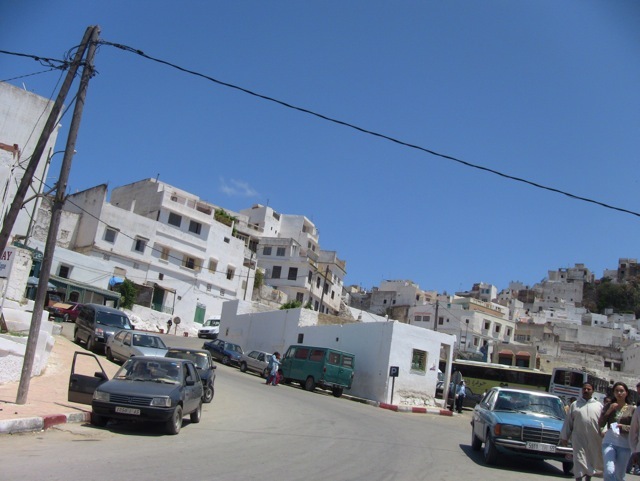 You can feel history around you when you visit Moulay Idriss. We opted to take the bus back to the hotel, where we hung around the pool area, did some swimming, and I finally got a chance to write the details of the time we had spent in Morocco so far (of which you are now reading). At sunset, some of us once again converged on the pool deck, to watch the sun drop below the distant mountains. I grabbed Jamie’s Doubmek, and got to jam for about 30 minutes with Dror, Jaime, and some of the other tour members, as the sky changed from blue to orange to a dark pinkish red. 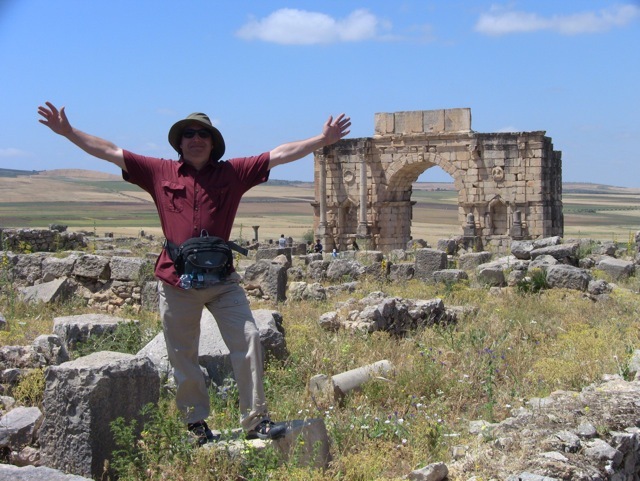 Before long the women were dancing, and another magical tour experience was had by all. I feel so lucky to be able to play the drum with two such talented drummers as Dror and Jaime. This is the vacation experience I was hoping for. At dinner time, we ate in the more formal dining room at the hotel. 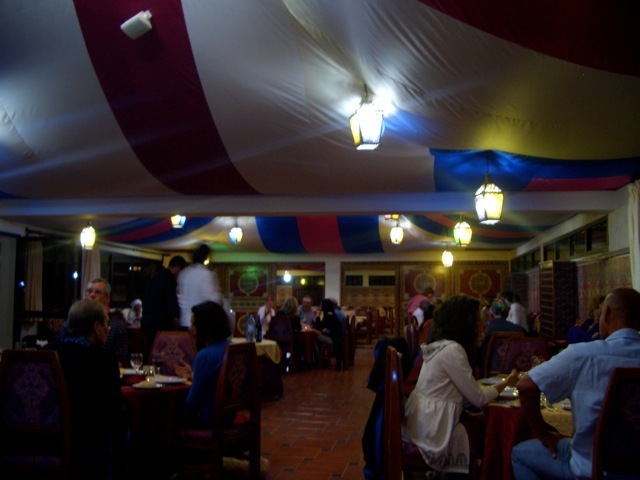 Low tables and chairs, under a colorful tent-like ceiling. Dinner started with bread, olive oil, a plate of vegetables (cucumber, egg-plant, carrots, potatoes, beets and greens). 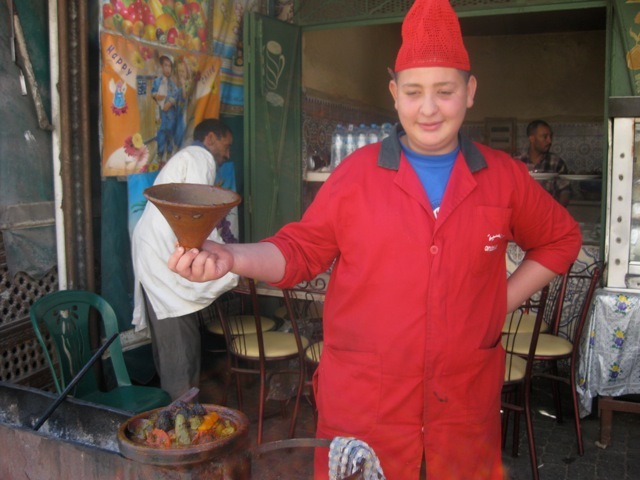 Then they brought big tajines (pointy clay pots) to each table, filled with a lamb stew with prunes and almonds. Delicious. 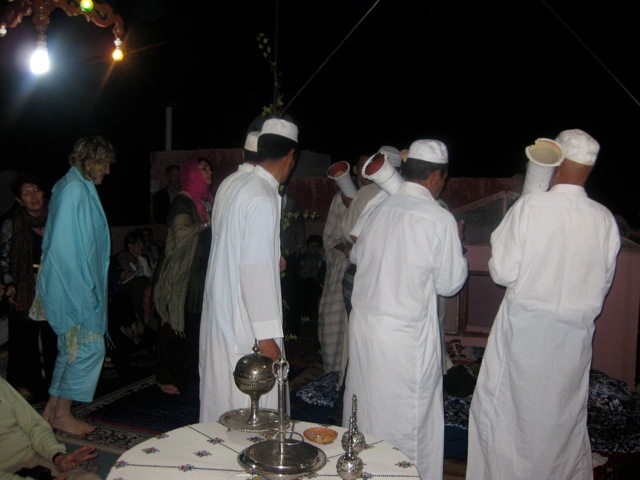 We were going to have an extended Sufi music/dance ceremony in the dinning hall, but plans had changed, and we were instead given the incredible honor of being invited to a private home back in Moulay Idriss (I guess the “performers” felt more at home there). Actually, these were not performers in the typical sense of the word. They were just doing what they do to praise god, and express their spirituality. All fifty of us gathered on the roof of their house, under the stars. 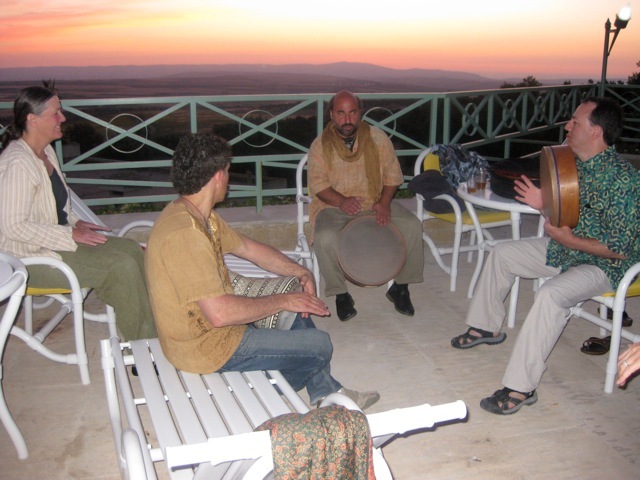 The six or so Sufi musicians played drums, wooden flute-like instruments, and R’aita (a small double reeded horn). Before long they had us all on or feet dancing, and singing. Words cannot describe the energy and spirituality that emanated from the roof of that home that night. 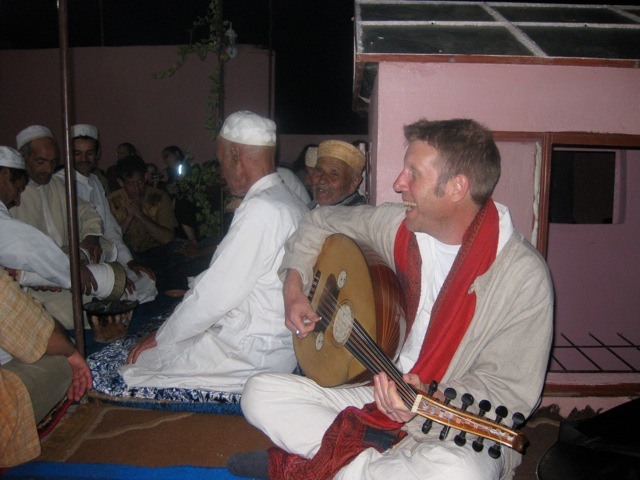 Yuval played his Oud, Dror and Jamie, and some other tour members played along with percussion. One tour member had her violin, another her flute. Mint tea, and cookies were enjoyed by all. It was almost 1am before we headed back to the bus to return to the hotel. The Sufi joined us on the bus, and the singing continued for the entire ride. 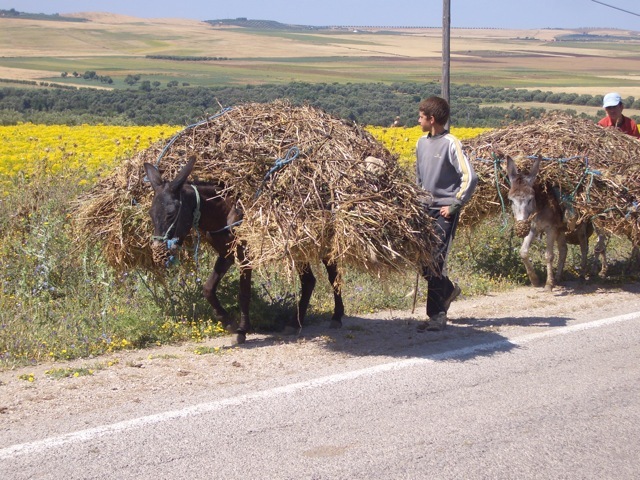 This entry was posted by andy on Wednesday, May 27th, 2009 at 1:11 pm	and is filed under Preparation. You can follow any responses to this entry through the RSS 2.0 feed. You can leave a response, or trackback from your own site.